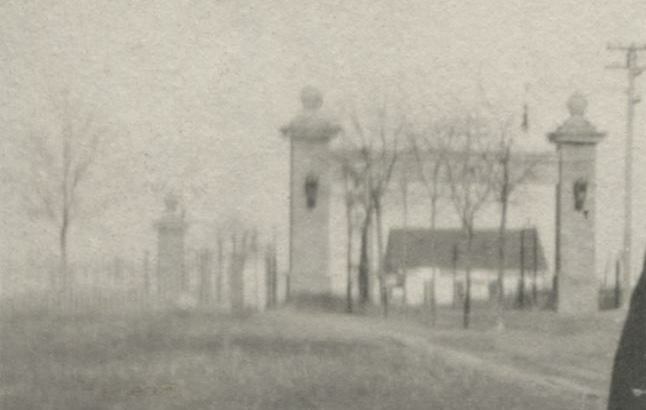 They were built as gateway markers to the Junius Heights neighborhood in about 1909 — they’re just not in their original location anymore. They were originally on either side of Tremont Street, half a block east of Ridgeway. They’ve been moved, but they’re only a stone’s throw from their original site. In 1973, when the city was in the midst of widening and connecting Abrams with Columbia, the 30-foot pillars were situated on a roadway which was going to be demolished. The pillars would have been destroyed were it not for the efforts of a small group of preservation-minded neighborhood residents who managed to raise enough money to have the historic East Dallas structures dismantled and moved. It took a while for the money to be fully raised, but the pillars were placed on their new sites in 1975. The thing that is most interesting about the saving of these columns is that this took place at a time when this part of East Dallas — Swiss Avenue included — was on something of a downslide. Many of the houses were in disrepair and many residents had moved out, seeking newer homes and better (i.e. newer) neighborhoods. Thankfully, in the early 1970s people began to focus on historic preservation, and the area began to make a slow comeback. Thanks to the preservation efforts of these people, their persistence in gaining “historic district” status for Junius Heights and Munger Place, and their successful fights on zoning issues, the areas surrounding these stone pillars are once again highly desirable neighborhoods, full of homeowners who are good caretakers and thoughtful preservationists. The pillars were actually built as a gateway — the columns connected at the top, spanning Tremont. 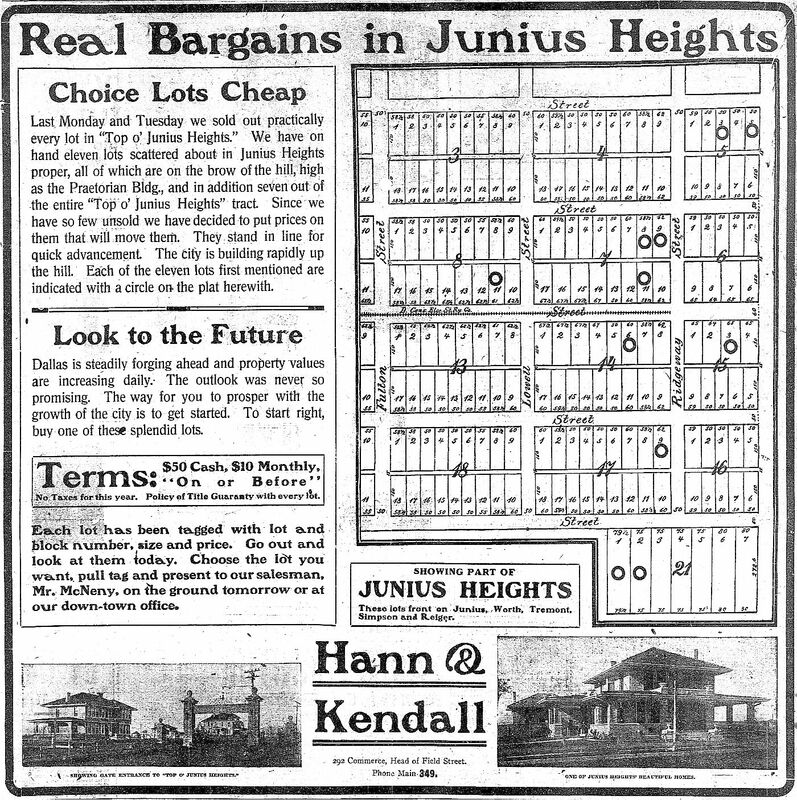 Lots in Junius Heights first began to be sold in 1906; in 1909, the second addition — called “Top o’ Junius Heights” — began to be offered for sale. The opening of the second addition appears to be when the gateway might have been built. 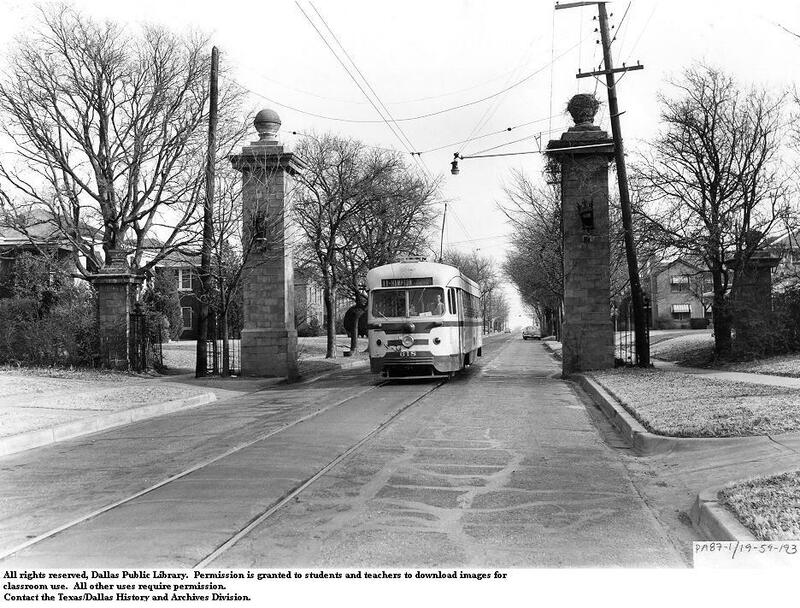 Not only did this gate serve as an entrance to Junius Heights, it actually separated the two additions (see clippings below). 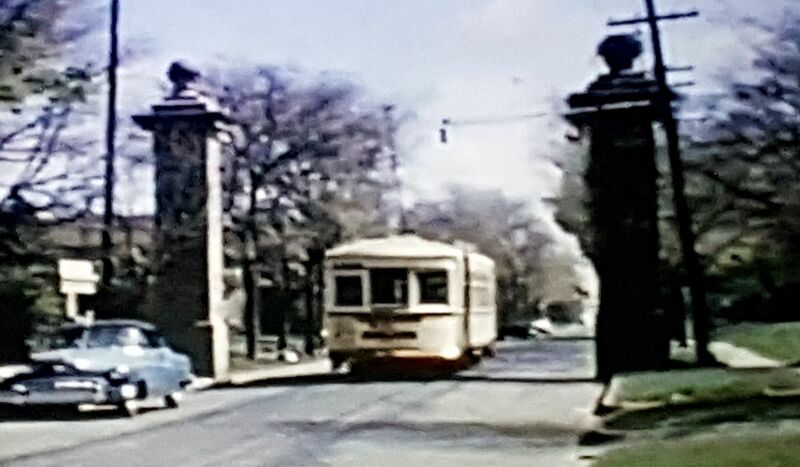 It was also a handy landmark, and for many years it stood at the end of the Junius Heights streetcar line (which ended at Tremont and Ridgeway). 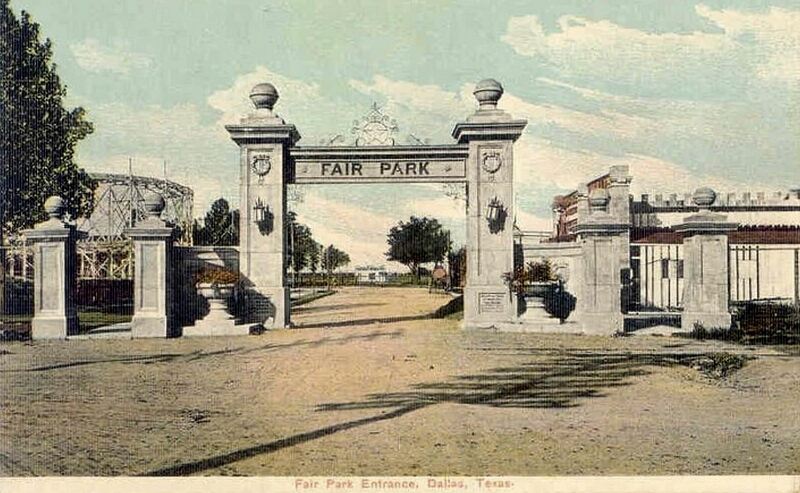 It was pretty exciting finding that photograph from 1909, but it was also pretty exciting seeing a photograph posted in the Dallas History Facebook group by Jerry Guyer which shows a dreamy-looking view of the gate as seen from the yard of the home owned by his great-uncle, A. P. Davis, who lived at 5831 Tremont between 1911/12 and 1921/22 (see what the house looked like back then, here). The house was on the northwest corner lot of Tremont and Ridgeway (it is still standing), only half a block away from the gate. This detail of that photo is fantastic! Here is the same photo as the one at the top. Note that this “gateway” has actual iron gates and that there are smaller secondary pillars on the opposite side of the sidewalks. Also note that the pillar on the right actually extends into the narrow street. Top photo is from the Texas/Dallas History & Archives Division, Dallas Public Library (with special thanks to M C Toyer); DPL’s call number for this photograph is PA87-1/19-59-193. 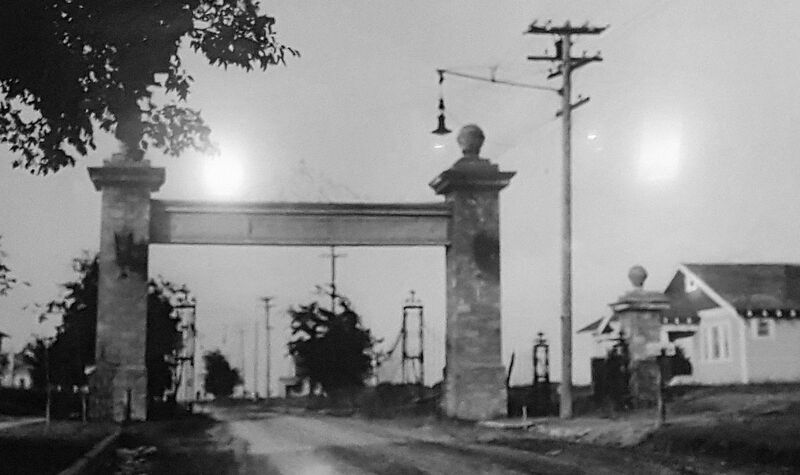 Photo of the view of the gate from the home of Andrew P. Davis is from the collection of Jerry Guyer, used with permission. More info on Junius Heights and the saving of the pillars can be found on the Preservation Dallas site, here. East Dallas and Old East Dallas are fiercely proud of their history and fight for preservation issues. It’s a bit difficult for me to visualize where these pillars were originally. 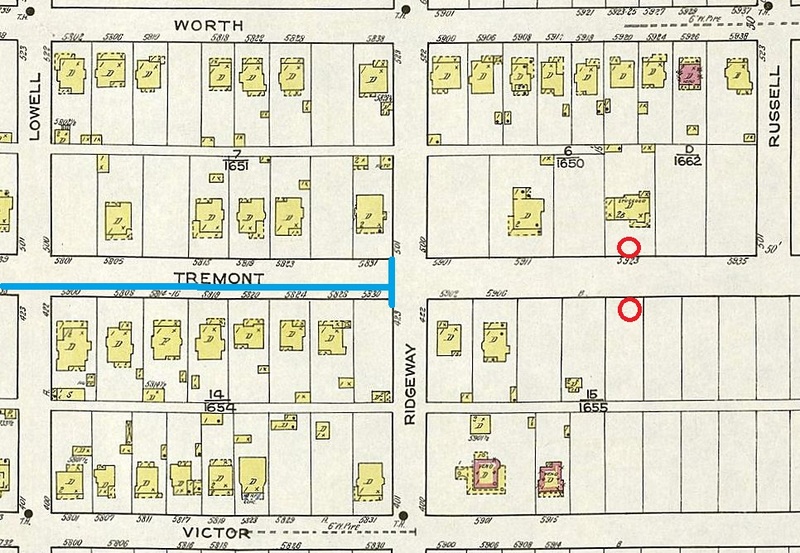 Here’s a 1952 map showing Tremont with the approximate location of the columns before they were moved. And here’s a present-day map, showing the post-Abrams extension. 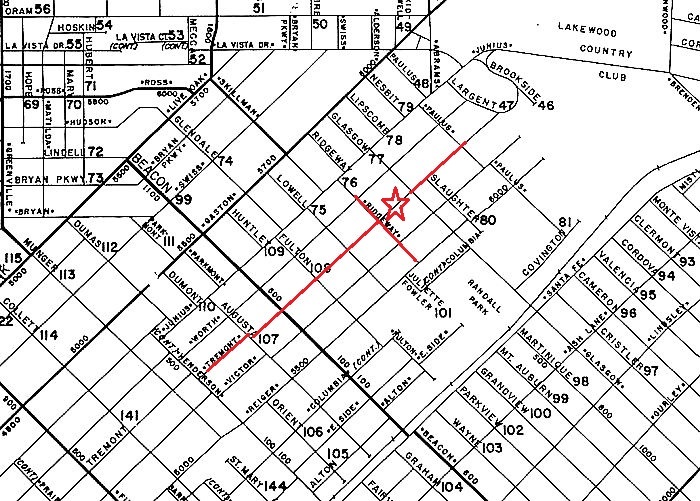 I’m not sure exactly where those pillars originally stood, but it was near the intersection of Tremont and Slaughter seems to have been between Ridgeway and Glasgow (location edited, thanks to Terri Raith’s helpful comments below) — this location is circled in red on the map below; the locations of the pillars today are in blue. Great historical account Paula. I’ve heard bits and pieces of the story, but this is the first full account I’ve seen. Thank you. Re: original location of the columns. 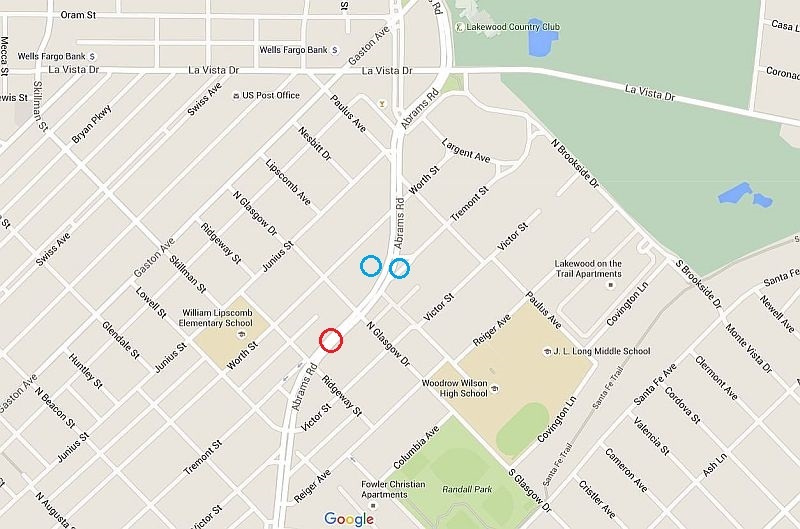 One was at 5918 Tremont on the south side, and at 5923 Tremont on the north side, between Glasgow and Ridgeway. 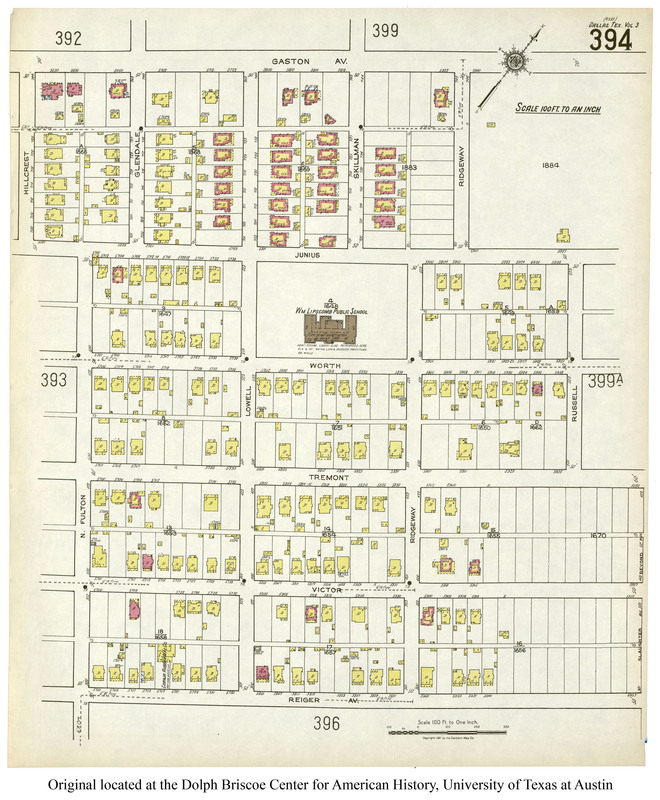 This 5900 block of Tremont became the 1500 block of Abrams as we know it today. The Slaughter location is actually where they are now. There is still a bit of the foundation of the small column in the yard at 1523 Abrams. The 1518 side was lost to create 4 more lanes for Abrams. Thank you for pulling together all of this info on the columns! There is also a fascinating photo of the columns on the wall at The Heights restaurant in Lakewood. Thanks, Terri! The mention of “Slaughter” in those 1973 articles threw me because it didn’t make any sense. I looked at 1523 Abrams on Google Street View — is the foundation for the smaller column hidden under bushes? The red brick house next door (I’m not sure of the address — maybe 1517?) — at the school zone sign — looks like this: http://binged.it/1WQzZTe (zoom in). It looks like something was removed and cemented over near the curb (next to a driveway that is no longer there), and there’s an odd foundation-like short wall back toward the house. I live at 1518 – formerly 5918. I have one old picture of the front yard where you can see the column out front. I still want to find out WHERE that photo at The Heights came from. They say library archives, but I’ve NEVER come across it anywhere else. I’ll have to stop by to see that. Could it be from the Dallas Historical Society? Hey, Terri, I’ve added some new images to this post, including a photo of the columns from 1909.